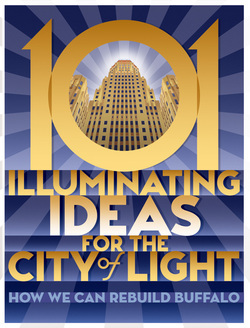 101 Illuminating Ideas for the City of Light: How We Can Rebuild Buffalo is about the power of homegrown ideas. It's about urban revival. We believe that the combined effect of our passionate words can transform ideas into something tangible: action. The book will include 101 ideas to revitalize Buffalo -- will yours be among them? Submit your dreams, plans, and what-ifs for the City of Buffalo. What would you like to see? Are you already working on something? Why not take a chance and share YOUR illuminating idea? This can be just a short piece, no more than two typewritten pages, detailing your ideas for the renewal of Buffalo. It may be formatted in a variety of ways: as a letter to the city, a detailed description of a particular project, or a vision for the future. Buffalo Heritage Unlimited will publish and promote the book, and the cover art is by well-known local artist Michael Gelen. Proceeds from the book will be reinvested to help bring to fruition the ideas it contains.